A Reflection on Newtown Tragedy: What Will We Learn, If Anything? As we move another day away from the tragedy in Newtown, we must ask ourselves what we have learned from this event and will anything change? It is a question that must be asked considering this is not the first time we have been confronted with a massive loss of life due to the gun-happy culture that pervades the United States. When we have been hit like this before, very little, if anything at all, actually changed in terms of trying to ensure the safety of the average citizen. So why would this be any different? I’m not here to argue that guns or drugs or violence on TV are bad things and we should do away with all of them once and for all. I have plenty of friends and family who own guns, mostly for hunting, and have been responsible in their approach to ownership. But we have reached a point where we must address an element regarding guns: what is too dangerous for the public? Many gun advocates will, of course, refer to the Second Amendment and say the Founders never intended for there to be any restriction on gun owning. But the problem is the Founders did not envision the weapons we own now and the destructive power they contain. There are more elements to this argument but let’s just focus on the shear power of guns for now. The point about the Second Amendment that must be addressed is the language included within. The word “arms” is all that’s referred to in the Constitution. This could be taken as anything that is a weapon should be available and legal for the average citizen to own. So, nuclear bombs are fine? But they aren’t and I’m sure most gun advocates would agree is a good thing, for instance the views expressed by one infamous gun advocate in the documentary Bowling for Columbine. But if we accept certain “arms” are too dangerous for just anyone to have then the next step in this debate is the realization the word “arms” is now subjectively defined by each and every individual. Which begs the question, are there guns that should be deemed too dangerous and even considered weapons of mass destruction? After last week’s tragic shooting, it’s hard to argue they aren’t. We can’t accept events like this as routine. Are we really prepared to say that we’re powerless in the face of such carnage, that the politics are too hard? Are we prepared to say that such violence visited on our children year after year after year is somehow the price of our freedom? We are used to the idea adults will give their lives for freedom through wars and protests that sometimes turn violent but are we truly just going to accept our children should also pay the same price? It is highly likely the U.S. will see another shooting spree in the future and also likely one will occur in a school. If the weapon is less powerful, the victims will have a better chance. So what’s the price we are going to put on the additional victims of the next tragedy because the weapon is so powerful? To take the question one step further, if you are a parent, which school would you have wanted your child in last Friday? The Newtown school or the Chinese one? The answer is obvious. The next step in this debate is justifying ownership of these weapons by the common citizen. The onus of this justification is, of course, on the advocates of gun-owning and they have typically gone to a few commonly made arguments. The first is that the weapons are needed in the event someone they don’t like takes over the government, turns the military on the populace, and needs to be removed. Just one major problem. If it is accepted the average person shouldn’t own the powerful weapons used by the government, what good is, say, an M-16 going to do for you against a drone armed with missiles thousands of miles in the air? How about against a tank? Battleship parked off the coast? TV guided rocket fired from hundreds of miles away? You get the picture. This justification is irrelevant in this day and age and no longer has any business in this debate. Only the most psychotic would believe they could stand a chance against that type of weaponry. Another argument is that gun collecting is a hobby and should be treated as any other hobby. Two problems with that. First, what if Cuba decides nuclear weapons are a nice hobby that other countries participate in and they want some as well? Are we comfortable with that? Didn’t think so. The second problem is weapons of mass destruction are not like other collecting hobbies like butterflies or baseball cards. Last time I checked, there weren’t a lot of mass killings due to a stamp collector psychologically snapping and gluing stamps on dozens of people which then led to their deaths. When one of these hobbies becomes as dangerous as gun collecting, we can address what needs to be done. Until then, gun collecting is in a class by itself and should be addressed as such. One last argument used by the gun owners is car accidents cause more deaths than guns. True but the key here is the word accidents. When someone dies because of a car, the vast majority of the time it is an accident and someone probably broke a traffic law at some point along the way. When someone dies due to gunfire, it is not always an accident. In fact, you could argue what happened was entirely intended, including the performance of the weapon itself. The major difference here is there are reasonable laws surrounding automobiles while the laws surrounding guns are, in some cases, downright ludicrous. Before we set foot in a car, we must be a certain age, have a valid drivers license, and have the proper insurance. Then we must obey speed limits, stop signs, yield signs, traffic lights, school crossings, have our emissions within the law, drive on designated streets and within designated lines meant for automobiles, not drive under the influence of any substance that inhibits performance, etc. etc. This is, of course, after the car maker has already followed many regulations in terms of gas mileage, safety belts, air bags, brakes, and many others just to get the car on the road. How many lives would these gun laws save? Customers can legally buy as many weapons as they want in Arizona as long as they’re 18 or older and pass a criminal background check. There are no waiting periods and no need for permits, and buyers are allowed to resell the guns. To say this type of laissez-faire environment on weapons of mass destruction is even remotely reasonable or comparable to the regulations on automobiles is insanity. Using the comparison of auto deaths to gun deaths as a justification for putting such destructive weapons on the street so easily makes no sense whatsoever and does not stand up to any actual scrutiny of the position. Let’s face it, a big part of the reason we have such an unreasonable gun culture is the idea we need them for self-defense because a situation may present itself where we need to suddenly turn into Rambo. The obvious counter to this thinking is these situations just rarely ever happen and the real-life Rambo stories are virtually non-existent compared to the number of tragedies. Some people buy their guns thinking they are going to be the hero but this just isn’t the case and is becoming even more unlikely. We are fed the sensationalized version of the United States through the media and believe the worst is always just around the corner. But it’s not and the facts are continuing to prove that. The violent crime rate in the U.S. has dropped nearly ever year for the past two decades and it seems likely this decline will continue. The likelihood you will need a gun because you are caught in a tower at your wife’s office Christmas party when a group of well armed thieves break in to steal $500 million dollars is pretty slim and the idea this should justify the ease in which people can buy such dangerous weapons is lunacy. But this argument is typically followed by another point that does not make sense when looked at critically. “Well if we aren’t able to get the dangerous guns then all the criminals will have them instead because they will be easier to get.” Really? How does that play out in your world exactly? This idea is pure nonsense and is only fueled by the movies we see which have distorted reality. 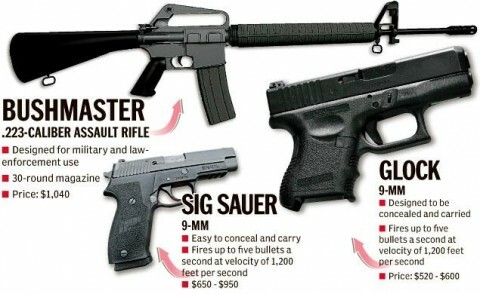 Criminals have these weapons now because they are easy to obtain. If a reasonable restriction or even a (highly unlikely) ban was placed on them, the supply would ultimately diminish. If the supply diminishes, the guns that do exist are more expensive, harder to obtain, and less likely to fall into the hands of the common criminal. It’s just basic economics that when the supply goes down, the price goes up and your common purse snatcher is not going to have the dough to make such a purchase. The thought that they would somehow be easier to obtain for criminals is not in any way true and could only come from a right-wing economic thinker who has no grasp of basic economic principles yet erroneously believes they do. See these fictional characters? You are not them and never will be. One final point branching off the last one is the fact we are allowing guns to be bought so easily and the effect is the killing of children. Not enemy soldiers or criminals or rebels or terrorists but innocent kids. You can buy a gun for your home or to carry on your person but you cannot give them to your kids and no one wants teachers to be carrying while teaching so schools will always be an easy target for a psychopath. If we allow the most destructive guns to be easily sold in order to find their way into the hands of the mentally unstable, we put our kids at risk. By not acting or saying we cannot change things, we are placing the blood of any future victims on our hands. Placing reasonable restrictions on weapons or reassessing our view of guns as weapons of mass destruction is a step we could take to save a life in the future. Doing nothing means we have put a price on that life and have deemed it unworthy of logical action. Take a look at your child and ask yourself if that price is worth it. Stating there is nothing we can do is simply cowardice rearing its ugly head once again, just as it has after so many other tragedies in America. Have we learned anything yet? Posted on December 18, 2012 December 18, 2012 by Paul PhillipsPosted in Media, Politics, UncategorizedTagged gun control, gun laws, gun policy, newtown shooting, violent crime.